hello movie fans its me travis? in this blog i will review movies i have just seen. i will have a rating system. one ? means the movie is pretty bad. two ? mean the movie is ok, and three ? means see it. with that. yes, two ?. i was first turned on to this movie when i met kane hodder at a local comic convention. he said it was one of the best movies he had worked on. that's saying something from the guy who played jason from the friday the 13th movies 4 times. he has also appeared in numerous other horror movies. well my friend glen was with me and he said that the movie sucked, but i also know glen doesn't love the horror movies likes i do. so. 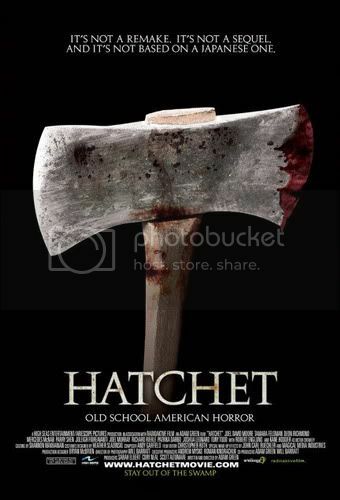 hatchet is the tale of victor crowley and born disfigured man. who is made fun of and terrorized. does this sound like friday the 13th anyone. then gets killed in accident. wow does this really sound like friday the 13th. so some years after the event a bunch of college kids go on a haunted swamp tour and get more then they bargained for. this movie is funny, super gory, and about half of the actors can act. so if you are a fan of the slasher genre you will like this one. i will also say kane hodder as victors dad i was very surprised on how well he did.